We recently tried Hobo’s Café in Brighton, Vt. We were taken by surprise with this Island Pond restaurant’s authentic barbecue and varied menu. 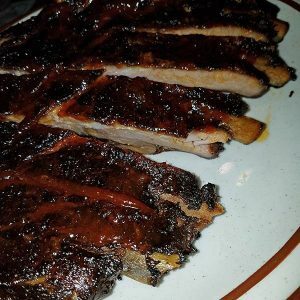 Once we heard that there was a BBQ restaurant in the Kingdom, we knew we had to make a special trip out there – and we were not disappointed. The restaurant is located right downtown on Cross Street, so though it doesn’t have parking for the building, it is kitty cornered to the large free parking lot at the end of Main St.
As we approached the restaurant, we were immediately met with smells of BBQ as other patrons opened the door in front of us. It was a tantalizing preview of the food to come. The dining room is reminiscent of an older diner. Banquet tables and chairs provide the seating and there isn’t much in the way of ambiance, but colorful walls and historic prints of old Brighton/Island Pond brighten up the space. What the dining room lacks in initial atmosphere is more than made up for in the food. The menu offers more than BBQ options. Burgers, soups, a few sandwiches, and some crowd favorites like meat loaf and chicken Alfrado provide some variation. A kid’s menu with four options is available for only $5 a meal. Friday’s are fish night – with fried haddock, scallops, and whole belly clams (when in season) rounding out the specials. But, the star of the show is the barbecue! 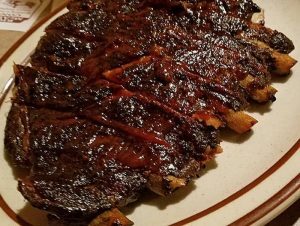 Ribs, pulled pork, brisket, and a host of traditional sides are the heart of this restaurant. Meat is started in the early hours of the morning, rubbed all over with a homemade rub. It is then slow smoked with a combination of hickory and apple wood finishing just in time for lunch. For our visit we stuck to just barbecue. I ordered the pulled pork sandwich while my husband ordered the rib platter. 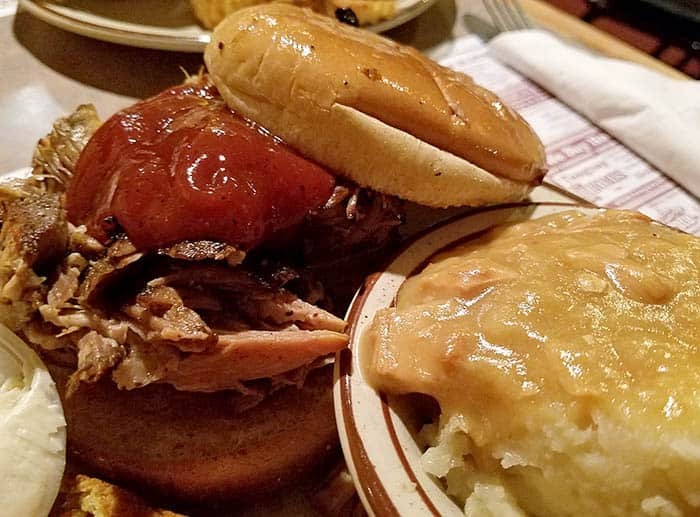 Hobo’s Café has two sizes for each of their barbecue meals – the smaller size comes with one side while the “platter” size includes two sides and corn bread. You can choose from French fries, house made coleslaw, house baked beans, mashed potatoes with gravy, or seasonal vegetables. Our meals came out quickly, and our plates were heaping with food. I was glad we hadn’t opted for an appetizer. My sandwich was overflowing with pulled pork topped with a helping of the zesty, house made bbq sauce. I was pleased to find the sauce didn’t have a lot of heat and the pork fell apart in my mouth. Instead of finely shredded meat, this pulled pork had large chunks of meat. Every bite was filled with flavor emphasizing the slow smoking process and spices used to rub the meat. I had ordered just the sandwich so it came with one side. For that, I chose the mashed potatoes. This came with chicken gravy. On its own, this side dish was tasty and the gravy was a thick consistence, which I prefer. When paired with the pulled pork, the lightness of the gravy was overpowered. I would recommend a different side with this particular dish only for that reason. My husband’s ribs came out beautifully! The outside had that char required of good ribs. The sauce had been added after the cooking process (as it should be) and so the meat wasn’t soggy. Instead, the sauce was sticky on the outside allowing the smoked flavor to shine through in each bite. And the meat fell from the bone. 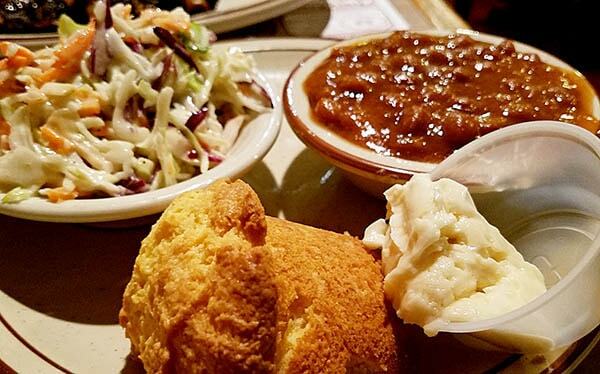 Baked beans and coleslaw were chosen for the sides. And these were not afterthoughts. The beans were made with brown sugar, a little sweeter than we were used to. I am not a baked bean fan, but had to try them anyway because they smelled incredible. My husband is picky about his coleslaw, but really enjoyed the slaw here. Shredded carrots and cabbage dressed lightly and included an acid that brightened it up. I had meant to ask what exactly was added to it, but when we had a chance to talk to the person in charge, I became so engrossed in the story he was telling that I forgot that detail. Before I get to that great story, I want to give special attention to the corn bread! It was delicious! Baked in large muffin tins, a serving is half a muffin and it isn’t enough. I’m telling you, you will want to eat pans of this concoction. The consistency of traditional corn bread, there is a sweetness provided by the maple butter slathered on it. It was lighter than most corn breads, not as dense, and it was moist instead of dry. Ordering an extra side or two will be well worth it. For the amount of food we received and the quality, the prices at this Island Pond restaurant can’t be beat. The platters are $14 or $15 while the sandwiches or smaller plates are $10 – $11.50. Both of us had to bring food home. At the time we visited, Hobo’s Café was in the process of getting a beer and wine license. So we had coffee with our meals. Our total check, with tip, was under $40. For a large, sit down dinner in the Kingdom that is tough to beat. At one point during our meal the pitmaster, Rob, came out to check on tables and chat with guests. We were able to snag him for a few minutes and get him to tell us how he got into barbecue and how he ended up in Island Pond. The idea was that he would come back to Vermont and help run the place – bringing real barbecue to an area that was “in need of it”. At first Rob said that he didn’t think he wanted to do it. Starting a successful restaurant is no easy task. So he talked to a chef he was working with, and his brother. So Rob returned to Vermont. Check them out to get real barbecue right on the Canadian border. They are open for breakfast, lunch, and dinner.